Located east of the Connecticut River in northern Massachusetts, Mt. 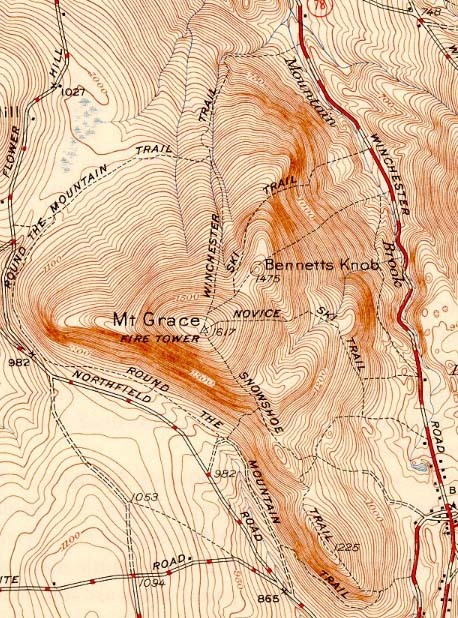 Grace was once home to multiple downhill ski trails, as well as a rope tow area. It is not known exactly when the trails were cut or when they were abandoned, however downhill skiing of one form or another was likely available from the 1930s to the 1970s. The CCC was involved with ski development on the mountain in the mid to late 1930s. The Pro Ski Trail was likely cut by the CCC and dropped about 1,000 vertical feet over the course of a mile. The Novice Ski Trail was likely cut by the CCC and dropped about 740 vertical feet over the course of 8/10th of a mile.
" CCC workers have done a rush job on trail clearance in Mount Grace State Forest at Warwick, Mass. " " Warwick--Complete skiing facilities in Mount Grace State Forest. " Championship racing course, excellent novice open slopes, trails. Three large parking areas. Adirondack shelter, fireplaces, drinking water. Loc. six miles from Orange, which is served by Boston & Maine Railroad. " "Vast Network Of Trails Ready For Skiers" The New York Times. 10 Dec. 1939.